The lead pollution crisis of the Washington, D.C. water supply – and the culprit that caused it, the water disinfection chemical chloramine – is a powerful example of how things can go terribly wrong when water quality problems are considered and tackled in isolation. Earlier this year, Virginia Polytechnic Institute and State University (Virginia Tech) scientists reported the shockingly high lead levels in the blood of young Washington, D.C. children tested between 2001 and 2004, when the District of Columbia’s drinking water was being contaminated with lead from aging pipes. Chloramines and lead pipes: Not so good together American water utilities are increasingly switching to chloramines, a mixture of chlorine and ammonia, for final disinfection of drinking water. Chloramine was supposed to be a “safer” water disinfectant than chlorine because it reduces formation of toxic chlorination byproducts. A 2005 survey by the American Water Works Association found that approximately a third of all utilities now use chloramines. We all accept that water disinfection is a public health necessity. However, we need to thoroughly consider the full impact of any chemical added to drinking water given the current water distribution infrastructure in place, not in some theoretical vacuum. As described by Duke researchers, chloramine-induced lead leaching might be lessened by the addition of anticorrosivity agents during the water treatment process. Is that sufficient for protection of public health? We really don’t know! Chloramine itself has been associated with severe respiratory toxicity and skin sensitivity. Overall, despite ongoing research, water treatment chemistry is still insufficiently understood by scientists and specific water quality outcomes depend on the particular chemical interactions found in each water treatment and distribution system. Here comes a second unpleasant “surprise” for those in lead-piped locations: fluorosilicates have a unique affinity for lead. In fact, lead fluorosilicate is one of the most water-soluble forms of lead. In fact, fluorosilicic acid has been used as a solvent for lead and other heavy metals in metallurgy. In industrial applications, chemical engineers rely on this acid to remove surface lead from leaded-brass machine parts. Research shows what happens when we mix it all up What happens when fluorosilicates in water pass through lead-containing pipes and metal fixtures? Not surprisingly, the fluorosilicates extract high levels of soluble lead from leaded-brass metal parts (researchers from the Environmental Quality Institute of the University of North Carolina-Asheville performed this actual experiment). North Carolina researchers concluded that the supposedly innocuous – and purportedly beneficial – quantities of fluoride added to drinking water may, in fact, precipitate a cascade of serious health problems, especially when chloramines and lead pipes are added into the mix. Do we even need fluoride in tap water? The mixture of chloramine and fluorosilicates in drinking water causes extensive leaching of lead. We cannot dispense with water disinfection – everybody acknowledges this. Thus, chlorine and chloramine are probably here to stay for some time. On the other hand, fluoride, or, specifically, water fluoridation with fluorosilicates, is quite dispensable. But wait – isn’t fluoride the miracle chemical that improves dental health? Well, yes and no. Much of what is publicized today in caries prevention programs worldwide is derived from the theories generated in the 1950s and ’60s, when water fluoridation was actively promoted. As we now know, the main benefits of fluoride for dental health are derived from surface application on the teeth, not from ingestion. In fact, ingestion of fluoride causes dental fluorosis, a range of adverse health effects that includes mottling, pitting, and weakening of the teeth. These risks are especially significant for infants and young children. 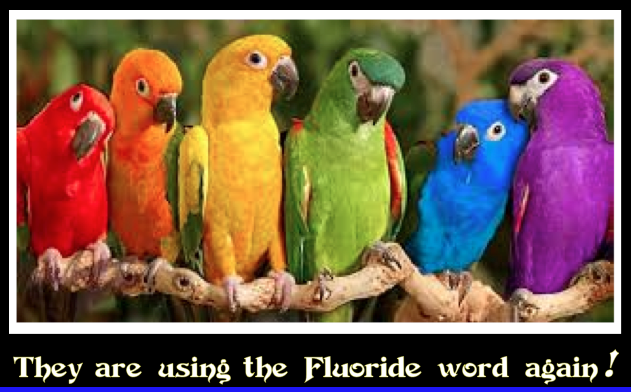 In the U.S. and worldwide, about 30 percent of children who drink fluoridated water experience dental fluorosis. In 2006, the American Dental Association (ADA) issued an “Interim Guidance on Fluoride Intake for Infants and Young Children.” ADA recommended that in areas where fluoride is added to tap water, parents should consider using fluoride-free bottled water to reconstitute concentrated or powdered infant formula to avoid excess fluoride. To learn more about fluoride health effects, read the recent report by EWG. The message: Don’t assess chemicals in isolation The lesson here is straightforward: it is completely unscientific to simply toss any chemical into the drinking water on the premises that this chemical might provide some benefits. The real question is: what would be the effect of this chemical given what else is going on with the water system? In case of fluoridation and chloramines, what emerges at the end of the pipe (our faucets!) is a potentially highly hazardous mixture of fluorosilicates, lead, and residual levels of disinfectants.